Christmas is my favorite! To be honest I just really love holidays and being festive, so since lots of other people feel that way at Christmas I enjoy it ten fold. I do advent with my kids, both the fun and the spiritual kinds, I started the tradition LONG before they could understand just because I love festivities. Yes I’m that Christmas-loving crazy lady. I enjoy traditions and hold them dear. I long to be focused on the reason for the season, and in our home that is faith and family. I also really love the baking, the parties, the decorating, and all the fun gayety that ensues. 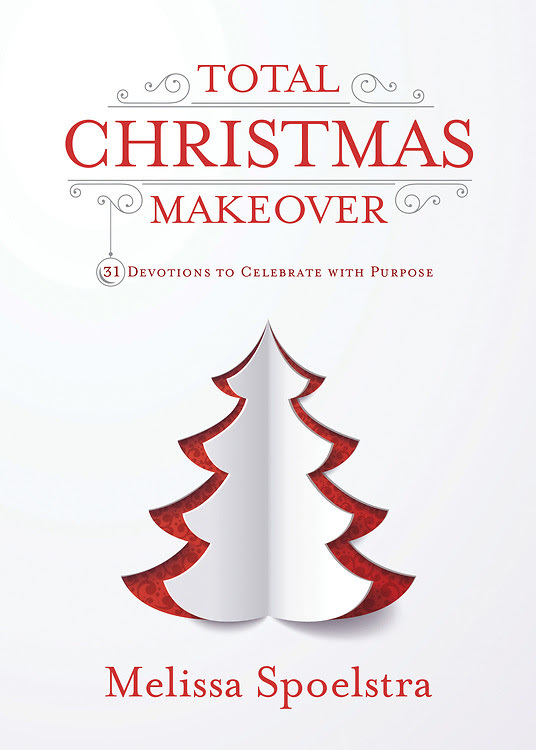 All that said, Total Christmas Makeover by Melissa Spoelstra is going to be a focus for me this year. It has brief and pointed devotionals that will be easy and important additions to my days leading up to Christmas. I am really impressed with how much Spoelstra packed into this tiny book. It’s small size makes it so easy to take with me on the go, but also that much less intimidating to consider adding to our full holiday season. I didn’t need to go much further than the introduction to know I needed to continue reading and that a revisit during the holiday season is a must. This is my spot during the holidays. A cup of coffee in hand and a book in my lap. Why not make it something that focuses in on Jesus. Each entry includes Scripture, some of Spoelstra’s thoughts, space for reflection in response to questions, and some practical applications. I love this format as it is totally doable and engaging. The book is split into three categories: ritual, relationships, and rest. Spoelstra noticed these three elements were included in Biblical celebrations. Each topic has ten days of devotionals to explore and take you deeper. As my heart’s desire is to know God’s Word more so that I can know His character and His promises, I love the idea of diving into festivities in the Bible and to understanding them better as we approach the greatest celebration of all – the Savior’s birth. I really couldn’t put the book down, but the great thing is that the brevity of the entries make them so accessible and easy to do daily. I hope you will consider grabbing a copy of sending it as an early Christmas gift to someone you love. My boys will be so excited when “Shep” arrives for the Christmas season! What kinds of traditions does your family do? What do you avoid during the holidays? I’d love your thoughts on gift giving. I always struggle a bit in that area as I love making thoughtful, homemade gifts, but I also like practical gifts or to give things I know people really want or will use. I also stay on a budget, but struggle to want to bless those I love. How do you approach this with your friends and family? Stay tuned for more thoughts from me.